After getting freedom, a meeting was organized to select the first General of Indian Army. Jawahar Lal Nehru was heading that meeting. Leaders and Army officers were discussing to whom this responsibility should be given. In between the discussion Nehru said, "I think we should appoint a British officer as a General of Indian Army as we don't have enough experience to lead the same. "Everybody supported Nehru because if the PM was suggesting something, how can they not agree? But one of the army officers abruptly said, "I have a point, sir." Nehru said, "Yes, gentleman. You are free to speak." He said ,"You see, sir, we don't have enough experience to lead a nation too, so shouldn't we appoint a British person as first PM of India?" Then, Nehru said, "Are you ready to be the first General of Indian Army? He got a golden chance to accept the offer but he refused the same and said, "Sir, we have a very talented army officer, my senior, Lt Gen Cariappa, who is the most deserving among us." The army officer who raised his voice against the PM was Lt. General Nathu Singh Rathore, the first Lt General of the Indian Army. If only a few hundred of Selfless leaders come forward, they can change the image of Armed Forces. So, if he was the first Lt. General, how was Cariappa senior to him? Am I missing something? "सदाचार से बढ़ कर मानव का कोई भी मनोरथ नहीं होना चाहिए !" तहे दिल से मेरा पूजा भाव समर्पित है नत्थू सिंह राठौर के प्रति ! Only aspiration worth pursuing is the virtue of morality. Wholeheartedly I extend my reverential salutations to Nathu Singh Rathore! Part of the above post is incorrect. 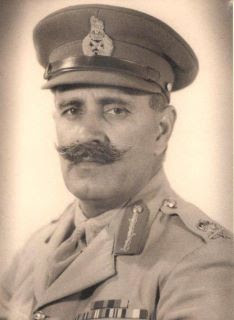 In 1946, Brigadier Thakur Nathu Singh was was offered the post of the C-in-C with command over the three defence services (Army, Navy, Airforce) after Independence by Sardar Baldev Singh who was then the Defence Minister of the Interim Government. At a tea party held at his house, Baldev Singh conveyed this to Nathu Singh, in the presence of several other leaders, including the premiers of Punjab and the North West Frontier Province. He followed it up with a letter, on 22 November, 1946, addressed to Nathu Singh:My dear Nathu, Your letter of 21st November has reached me. You have been selected and earmarked to be the First C-in-C of India, with Command over the three Defence Services. This decision has been arrived at, after the Muslim League joined the 'Interim Government', and with the consent of all the Political Parties comprising the Government. It is on the recommendation of the present C-in-C, and with the approval of the Governor General, the Viceroy, and may be the HMG. The approval of the officers senior to you does not arise. The letter goes on to answer several other questions raised by Nathu Singh, such as acceleration of nationalisation, integration of the three Defence Services, 'Dominion Status' for the country, and the appointment of an Indian as the next Governor General, after Lord Wavell. Baldev Singh also made it clear that after the 'Transfer of Power', the C-in-C would be working under the Ministry of Defence. In keeping with the highest traditions of the army, the selfless soldier declined the offer, since he felt that Cariappa was senior, and the appointment should rightfully go to him. (copy of the letter can be seen on Facebook page of Lt General Thakur Nathu Singh)https://www.facebook.com/pages/Lt-General-Thakur-Nathu-Singh-Late/585992794832855The incident with nathu questioning Nehru happened after independence... I quote from Maj Gen VK Singh book 'Leadership in the indian army' Quote"Soon after Independence, the Prime Minister held a conference of senior Army officers, to elicit their views regarding keeping British officers for some more time, as advisors. Nehru felt that Indian officers lacked the experience to take over the responsibility for such a large Army, and wanted to retain British officers for a longer period, as Pakistan had done. Almost every one agreed with Nehru, except for Nathu Singh. He said: " Officers sitting here have more than 25 years service, and are capable of holding senior appointments in the Armed Forces. As for experience, if I may ask you Sir, what experience do you have to hold the post of Prime Minister ?" There was a stunned silence, and Nehru did not reply. Finally, it was decided to keep the British advisors for some more time, as proposed by Nehru. Nathu Singh Rahore is great man.